The DePauw men’s and women’s track teams did not disappoint this past Saturday as they competed in the DePauw Indoor Classic at the Hollensteiner fieldhouse. Both the men and women took another step in preparing for the outdoor season by finishing in second place out of nine teams respectively. 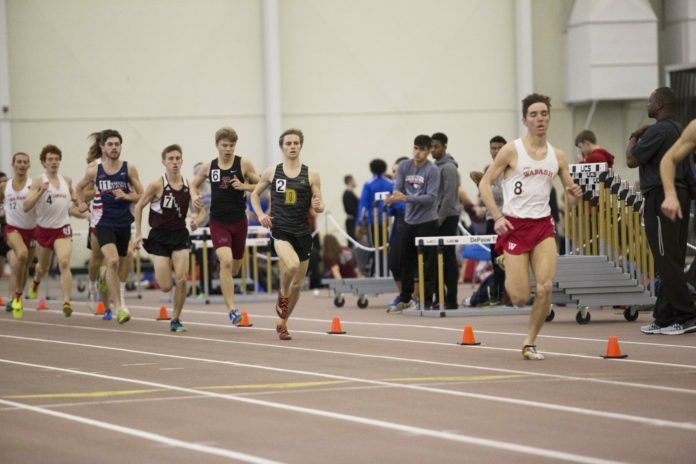 The DePauw men totaled 89 points, which landed them right behind Wabash College’s 115 points at the Indoor Classic. Sophomore Zach Batt led the Tigers by collecting a first place finish in the mile in 4:19.59. Another strong performance brought by the Tigers was the men’s 4×400 relay. The Tigers won with a time of 3:31.75. Sophomore Johnny Miller was second in the 400 meter in 51.56 seconds, racking up 10 points after also placing seventh in the 200 meter with a time of 23.69. Junior Nate Baker also totaled 10 points with third in the shot put of 13.47m/44-2.5 and a fifth in the weight throw, with a distance of 14.51m/47-7.25. Another third place finish was from first-year Jordan Booker in the 200m with a time of 23.47. Booker totaled 10 points after placing fifth in the 400m as well, with a time of 52.23. Meanwhile, the women finished with 80 points, 11 points behind Bellarmine University. DePauw earned two individual wins in the process of finishing in second place in the Indoor Classic. Two senior distance runners gave DePauw an enormous boost. Senior Lois Miller won in the 5000 meter run with a time of 19:18.65, and senior Claudia Monnett won in the one-mile run with a time of 5:07.01. Miller blew away her components by finishing 12 seconds ahead of second place. Senior Amanda Weber placed second in the 200m dash with a time of 27.74, and sophomore Kaitlyn Daanen recorded a third place finish in the 60 meter dash with a time of 8.10. This was the final home indoor meet of the season for the Tigers. Before the conference meet, they compete in the Fred Wilt Invitational next Saturday at the NCAC Indoor Championships at Oberlin on March 3.